My locals hosts a FoW tournament on both Thursdays and Sundays. Unfortunately, I work at both of those times so I haven’t been able to go to a tournament all semester. That was until today where I got off for winter break. I didn’t have a devoted deck so I threw my build together today at 2:30 for the 4:00 tourney. I was torn between running Bahamut or Vlad Tepes at the event. On the one hand I’ve playtested with Vlad more than any other J/Ruler in this game. She was the first ruler I ever really liked and I’ve ran multiple Vlad builds ever since I first cracked a Vingolf box a few months ago. On the other hand though, I thought Bahamut was more suited to combating Reflect/Refrain which is currently the most meta J/Ruler. Disclamer 1: I totally built this deck with the plans to combat Reflect World, a Reflect Refrain variant built around taking extra turns with the card Alice’s World. My roommate beat me multiple times with that deck in recent weeks. Frustrated I tried to build around the best way to disrupt that strategy hoping/assuming I could handle anything else. For that reason I chose to main Bahamut and side Vlad for the likely Blazer sighting. I played a close friend in what was both of our first FoW tournaments. The game was more or less even until I made in hindsight a glaring misplay. Yeah I know, yet another misplay that I’ll never let myself live down. So he flips Slyvia and in response I banish both of my resonators to the Demon Sword before he targets them. This causes Sylvia to kill his Wind Spirte, but ultimately it didn’t matter because he still got to untap his stones. I should’ve waited and banished the targeted resonator to make the effect fizzle. Using this extra mana he played Lancelot to kill me. Game 2, my opponent sided into Reflect/Refrain and I foolishly sided hate for Sylvia. However, Susanowo proved himself still relevant sniping my opponent’s Gwiber. However, this game ended up still taking over 40 minutes due to me being a blockhead in hindsight. My opponent had 3 Artemis Bows on board holding back Bahamut so I kept tapping for stones and fighting him with my resonators. To be fair I had settled on the game plan of winning off Split Heaven and Earth so I was trying to hold out for Thunder to take out his last 2 life post-Split. That Thunder never came though and I lost to 2 pumped Lancelots combined with his own Thunder. We both made a considerably number of misplays (my opponent didn’t banish Perceval to save his Lancelots a few times, for example). All in all it was a great match albeit an underwhelming start to the day. Though it was probably the most enjoyable match-up I played all day too. Oddly enough I played against my opponent during downtime at the Yugioh Regional on the 12th. For this reason I knew all about his Banzai Grimm deck prominently featuring Little Matchstick Girl. However, my deck was well-positioned against his thanks to my maindecked Flame King’s Shout. I took Game 1 off said shout when it took out his 2 Hunters in Black Forest and his Tinkerbell. Game 2 I sided in the remaining Shouts, but winded up defeating him in the air with Bahamut attacks. My opponent was very quirky and nice. It was really great that he understood Yugioh (my round 1 opponent did too) so we had a lot of fun making references and such. He also had a hilarious RWBY sub-theme to his deck that I really enjoyed seeing (He ran cards that looked like the main 4 girls from RWBY, an internet cartoon show I recently got caught up on). So my opponent made it very clear to me before, during and after the match that he was lacking a large amount of the cards for his deck (due to not being able to buy them before the tournament and leaving some on his desk). I played against him at the pre-release so I knew from that, he was really good. I’m honestly sure that if he had all the cards he was lacking that I would’ve lost or at the least had a harder time. He told me post game that the Heaven’s Rifts should’ve been basic dark stones. However, the fact that they weren’t allow me to hit him for 18 damage off Split Heaven and Earth game 2. I could’ve won had I hit him with Split twice, but he made me discard 1 copy using Nyarlathotep, the Usurper. After that I ended up using my FlameKing Shouts, Demonflames and Thunders to keep him off the board while I tried to draw into another Split. I didn’t see it and lost though. Game 3 I switched to Vlad and got in a decent amount of damage with Flame Sprite and Lancelot before he managed to stack multiple Robes of the Flame Rat to shut my creatures down. However, Vlad drains combined with a Split still did him on turn 6. So my opponent showed me that he too was packing Vlad in his side, but didn’t switch to her for some reason. It was a tense match and easily the most serious couple of games I played today. Still it was a good challenge overall. So with this record I took 3rd Place at the tournament and got this Christmas Lumia Promo! Yeah another disclaimer is that this was a free to enter 6-person tournament. Whether or not this removes the legitimacy is up to you, but I found it to be a very competitive, yet laid-back atmosphere. I really liked that. Maxing out on my ratios was probably not the best move: There were cards like Duet of Truth that I sided out every match, while at the same time other power cards like Cthugha/Lancelot were surprisingly hit or miss all day. Playing Bahamut I judgmented/J-Activated on turn 1 multiple times. This put my opponents on a fast clock, but at the same time made cards like Lancelot really dead. Also once Bahamut had to stop attacking and start tapping for stones it really hurt my momentum. Always be prepared for the worst possible match-ups: I should’ve prepared for Sylvia or at the least for something other than the noticeably absent Reflect World deck. Bahamut is perfectly countered by Blazer+Deathscythe. However, Blazer is then effectively countered by Vlad and Reflect/Refrain. This triangle is really interesting and makes side-boarding J/Rulers alot more difficult. Split Heaven and Earth: I know that not every deck will die to Split, but those that do die very hard. Laevateinn, the Demon Sword: This card is broken allowing Bahamut to J-Activate and attack on turn 1. I’m legitimately glad that Blazer exists now just so this isn’t tier 0. Rukh Egg: This little Sangan wannabe made Cthugha good. Everytime I sacked it I was beyond happy. As per the usual I should be sleeping right now, BUT we gotta get this sordid tale posted. If only because today was pretty crazy. I played Infernoids (closest thing to “meta” deck I thought). This deck is very strong and fun, BUT it can be played around and OTK’d very easily. I made 4 Extra monsters in matches all day. Omega is MVP of the extra hands down. 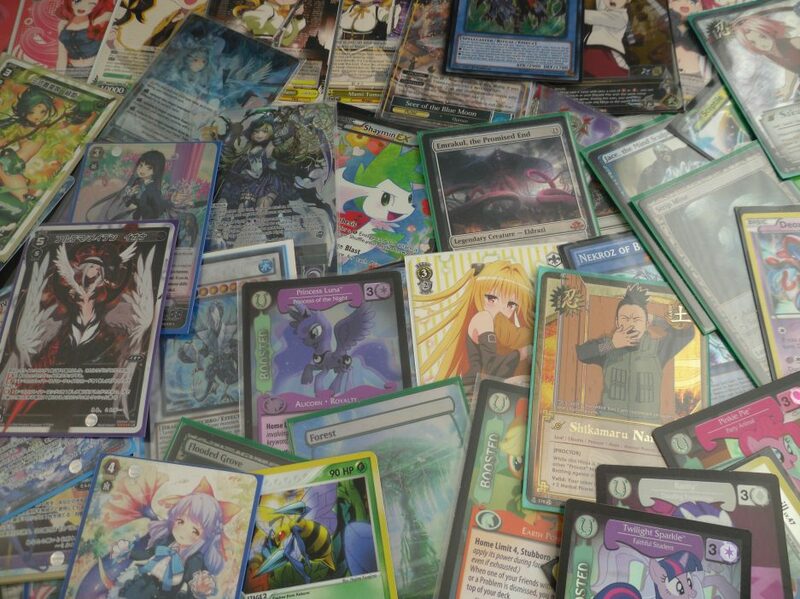 This was my side deck. Royal Decrees put in the most work overall. ALWAYS READ THE CARDS: I got cheated Game 3. I had Attondel on board and he has a Castel with no materials and an Oafdragon Magician. I normal summons Skullcrobat Joker and adds PERFOMAGE Mirror Conductor to invert Attondel and kill me. I don’t believe he intentionally cheated me, but I was demoralized afterwards. Infernoids wreck grave-based value no duh: Plants and Volcanics don’t like Infernoids. Together they just hate infernoids more. That being said this was probably the most interesting deck I faced all day. If anything it was the most original. Though it was not however the most interesting deck I saw though. Always wait for the target: I lost game 2 when he summoned Altair and I shotgun banished his Deneb allowing him to target another Teller, make Castel kill my Royal Decree and beat me. Luckily, when the same situation came up game 3 I righted the wrong. NEVER BLACKROSE A PLUSHFIRE: For some reason I forced a Black Rose Dragon to nuke his monsters/Pendulum-Scale while he had Plushfire on board. He then summoned Damage Juggler, rebuilt his board and killed me. Never leave Deactron in Attack mode: I punted a Game 1 I could’ve won by summoning a Decatron at 1200 lifepoints to have the Devyyaty and Ununcu on board. My opponent had 1 card in hand and then top decked Luster Pedulum to run over Decatron for game. He was a former Youtuber for Yugioh though so that was pretty cool. Horn of Heaven is Real: I got hit by Horn of Heaven at least 4 times over the course of the very short match. Also I learned that Skill Drain wrecks my deck at least when fighting against #30 Acid Golem of Destruction. Don’t Turbo into Star Eater: My opponent had a beautiful Ghost Rare Star Eater he made instinctively each game. It got in the damage, but obviously I had the outs. Lose 1 Turn wrecks Noids/Calm the salt: My opponent had me dead to rights using traps like Fiendish Chain and Lose 1 Turn. I let the tension get to me and I attempted to scoop up my cards and forfeit. I regained my composure and played it out after apologizing. I got destroyed anyway, but it was the right thing to do. Psyframe pal flipped Anti-Spell Fragrance and Magician mate opened 2 Weavering Eyes, Oafdragon, Apex Avian and Odd-Eyes Fusion. I pulled out the win after resolving Devyaty. We didn’t get to game 3, my opponent whiffed on 2 blind mind crushes though. It was rough. I got scraped/demolished/trashed and wrecked by virtually everything that set a Pendulum Scale all day. In order to make a viable non-Pendlum deck in the current era of Yugioh I think Anti-Spell Fragrance has become a staple. If I keep trying to play competitive Yugioh (which I really shouldn’t) I may have to buy it. The strength of Infernoid is mostly the power of Devyaty to wipe out backrow. I won most of my games off its effect and lost the most games when it was played around post-wipe and my opponent managed to rebuild their scale. Patrulea: Did I mention I hate backrow? Weirdly Reasoning either milled half my deck or flipped 1 monster and whiffed every game all day. I can’t nor will say Reasoning was bad, but it was very bizarre. Foolish is here became I didn’t play it all day and I sided it out literally every match. Thoughts on Infernoids In this Format? Every Magician player I’ve met told me that Infernoid is a hard match-up for them. I’m still not sure if it was just my inexperience with the match-up, but after how each of my match-ups went (literally going 4-6, with a bye losing to Pendulum decks 4 times) I think the match-up is unfavorable. I sided in 3 MST and 3 Fairy Wind literally every match-up, used them as best I could and still got wrecked. Though I’m probably going to either keep working on this deck or jump ship to something more defensive (Traps.Deck). I don’t begrudge the Infernoids and I still cherish this sacky, but fun deck. And now for the part of the post that invalidates literally everything I’ve written this far. Despite getting destroyed I went so plus off of my pulls and trades overall that this event PAID for itself. Rather than type I’m going to post pictures and let them do the talking. Shout out to my friend who got a deck profile with his Fluffal deck. I’m going in your footsteps man! In my 3 AM excitement over actually posting pictures of Kozmo Bank Destroyer I almost forgot the most important rule that was reaffirmed for me at the regional. Always go with friends, acquaintances or colleagues. There was nothing more stress-relieving than having a shoulder to cry on after getting wrecked and having soft jabs to take after you open broken. Also I want to give congratulations to my friend who got 13th place with his Magician deck and his invite at this regional Through his playtesting, smart investing (getting 12 Apex Avians back when it was $3 apop) and expert plays he built and managed the deck like bro. Anyway, with the Ygo Regional tomorrow it’s time to blog fast. So I drafted Izzet after a pack 1 Steam Vents (shockland easy!). I passed over Epic Experiment pack 2 for the foil Explosive Impact, but was passed a Mercurial Chemister. Pack 3 I believe I took the guildgate over some off-color bulk rare. I played the mirror match against a friend. It literally became a battle of who could assemble more creatures and which of those creatures had any form of evasion. I took game 1 off of Sphinx of Chimes. Sadly I lose games 2 and 3 (2 to being on the draw in a race of a match-up and game 3 to trying to race Lobber Crew pings with Doorkeeper mills). This match-up was a steamroll. My opponent was trying to stall against my Tenement Crasher. He bounced it twice, but it just came back for repeated attacks. Games 1 and 2 went by quickly in my favor, but I had to leave for work so I dropped from the event. I gave my opponent the match win. In hindsight I may have goofed making a flavor deck, but I had a lot of fun with this set. So as a side project behind Infernoids I finally acquired all of the Speedroid monsters! I got these to build an anime deck for Yugo (totally not named fusion). It’s been very fun so far despite having only seen 2 duels. There are alot of graveyard synergies in the build to utilize. The major issue of the deck is that I have no Clear Wing Synchro Dragon (#FlavorFail) and Speedroid Taketomborg restricts you to summoning Wind monsters the turn you use its effect. Still from the initial games this looks to be a very fun casual deck. Ok so this is was the best box I’ve ever split. While my first box split was meh, my 2nd split was ok and my 3rd split made me want to quit opening this game entirely (as I did write on this blog at some point). This was the first ever opening where both players left satisfied. So I pulled (with the help of my roommate’s insane luck) to open a stamped Valentina (which was what I wanted more than anything else from this set. I’m pretty hyped for building some degenerate Overlord Valentina deck. Before anyone says something, NO I’m not running or buying all Seven SKL rulers. I’m only getting Arla and Rezzard to combo with Melgis (and maybe old Valentina). With these 3 she’s at 1000 Atk/Def, putting her out of Flame range and giving access to some of the most potent God’s Arts and Names. HOWEVER, this is a challenge for another night as the regional is literally a few hours away. I really want to enter the main event for old times sake, but the final due Monday is a looming threat. I’ll probably end up making a poor decision, but I’ll pull through somehow. Here’s more pictures of pulls before I frantically mull over sidedeck choices and Hydrology terms.